Press SAUTE mode on Instant Pot. Add oil and once it's hot add cinnamon stick ,cardamom ,cloves and Bay leaf. Add potatoes and saute them for 2 minutes till they turn light golden brown. Then add sliced onions, green chillies,ginger-garlic paste.Saute for 2-3 minutes until they turn light brown in color -stir regularly. Add tomato and cook for 2 minutes till tomatoes turn mushy. Add curd,mint,coriander leaves, biryani masala powder, turmeric powder and cook for another one minute. Add rinsed Basmati Rice,water,salt and give a stir . 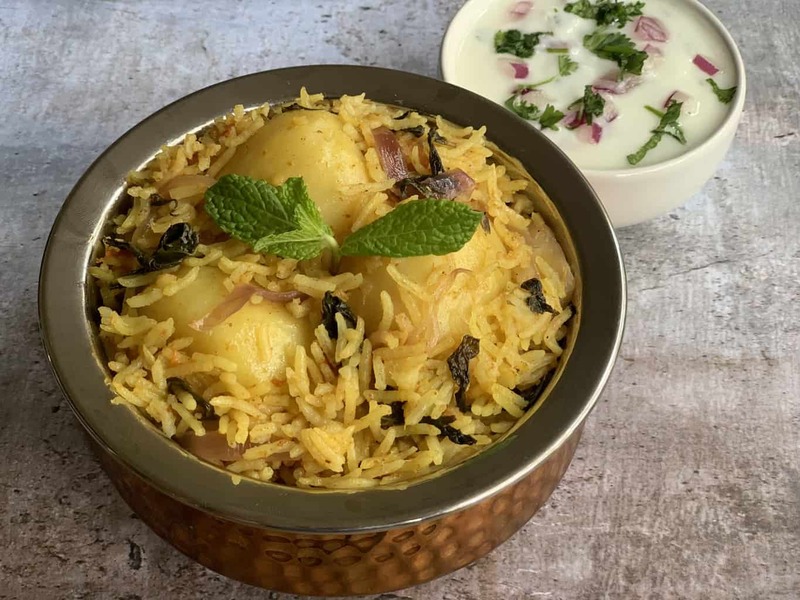 Aloo Biryani is ready.Serve with Onion Raita or plain yogurt. Heat a pressure cooker with oil on medium flame, add cinnamon stick ,cardamom ,cloves and Bay leaf. Cover the cooker with lid and cook for two whistles. 1. For Vegans ,you can skip yogurt and add lime juice. 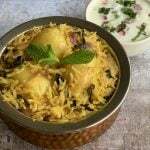 2.To make aloo biryani you can use baby potatoes or large potatoes, I have used cubed large potatoes here. 3.You can get biryani masala powder from any indian grocery store or amazon.You can use any brands. 4. You can also do a QR Release(QR) if you don’t have time and then open the lid. 5. You can increase or decrease spice accordingly. 6. You can add fried onions on top before serving.